The stigma attached to mental illness is only one in a series of barriers that many patients face when they seek help. Often, they must also contend with expensive treatments, an inability to find qualified providers in their area, and a lack of evidence to support treatment choices. These issues often go hand in hand with physical health problems, and both can be amplified in underserved communities. A Surgeon General’s Report in 2001 highlighted a lack of research on disparities in mental health services for racial and ethnic minority groups. Many experts agree that those conclusions still hold true 17 years later. But Patrick Corrigan, PsyD, of the Illinois Institute of Technology, has led two PCORI-funded projects on improving the health of minorities with serious mental illness (see box). We spoke with Sonya Ballentine and Marilyn Perez-Aviles, patient partners on Corrigan’s projects, about the importance of research that engages communities in better caring for their own and improving physical and mental health. How has mental illness affected your life? How did it lead you to participate in this PCORI-funded project? Sonya Ballentine: For 25 years, my mental illness went untreated. During that time, I developed a substance use disorder, experienced homelessness, and was incarcerated. But in 2011, I began treatment for posttraumatic stress disorder (PTSD) and an anxiety disorder. When my treatment ended, I looked around for something to fill my time, which is how I came across Dr. Corrigan’s project. I got involved just to have something that would get me out of the house, but I ended up becoming a patient partner. Sonya Ballentine and Marilyn Perez-Aviles worked on projects led by Patrick Corrigan, PsyD, of the Illinois Institute of Technology: an Engagement Award, which focused on African-American patients, and a research award focused on Latinos. The projects concentrated on minority populations with serious mental illness in Chicago. Over the course of the Engagement Award, an advisory board of patients, providers, caregivers, and other stakeholders developed a training curriculum that they then used to teach stakeholder groups how to implement community-based participatory research. Corrigan’s team and stakeholders then adapted that curriculum for Latino patients. 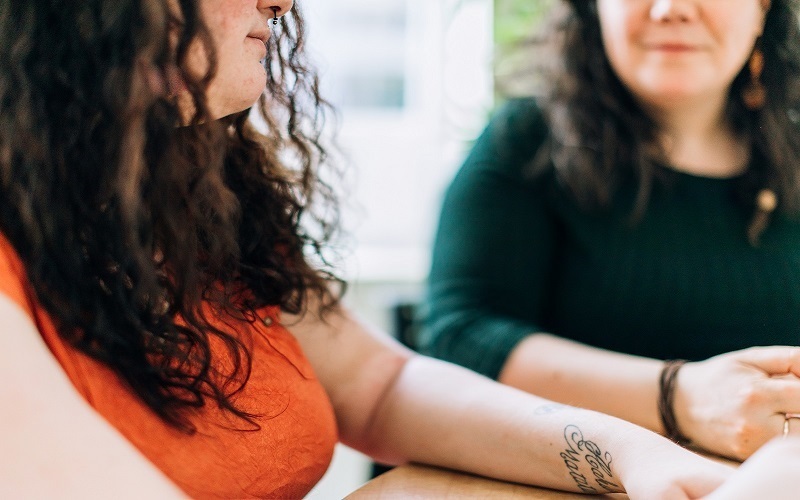 A major component of this culturally sensitive curriculum includes recruiting and training Latinos with a history of serious mental illness as peer navigators. Peer navigators guide and support study participants to help them overcome barriers to care. In the research project, the team compared integrated care with and without the peer navigators to see which proved more effective at helping patients improve their physical health. After a year, compared with people who received usual care, those aided by peer navigation reported having a better quality of life and more appointments with clinicians, the research team reported in Psychiatric Services. Marilyn Perez-Aviles: I’ve dealt with depression and PTSD for a long time. More than once, I’ve been suicidal. At 16, I began therapy. I’m also surrounded by family and friends who have experienced mental illness. When I saw flyers at my community counseling center about Dr. Corrigan’s project, I took one. I wasn’t doing anything with my life, and the brochure spoke to me. Mental illness can target anyone at any point in their life. I want to show people that they can be their own hope, their own light at the end of the tunnel. Have you experienced connections between physical and mental health? Sonya Ballentine: Prior to receiving mental health care, I knew I was experiencing physical pain, but my untreated anxiety and depression took so much of my energy and focus that I couldn’t address my physical concerns. Once I began mental health treatment, I started to follow up on physical problems. While mental and physical health go hand in hand, sometimes you have to focus more on one before looking to the other. Marilyn Perez-Aviles: I have type 1 diabetes, and prior to beginning therapy, my blood sugar was high every day. I was always in pain. That pain extended to my mental health. We aren’t in tune with our true selves when we’re ill. And mental illness is just as serious as physical illness. It gets in the way of your everyday life, just like diabetes does. What are peer navigators and how do they improve patient care? Sonya Ballentine: Peer navigators are people who have lived experience with the types of mental illness they now assist others with. Their community knowledge helps them to walk hand in hand to meet the needs of others. Those needs may be something urgent like homelessness or something less urgent, but no less important, like getting to doctors’ appointments. Because patient navigators have already taken the same journey, they can walk with people who are coming from this deep, dark place and bring them to a place of light and support and encouragement. Marilyn Perez-Aviles: Peer navigators know exactly what it’s like to have no hope in yourself or to be without a job or to have a substance use disorder. They can empathize, and they can help either by taking action and helping schedule appointments or by doing something like listening to people who have reached their breaking point. PCORI’s funding of this project allowed myself and others a vehicle by which we can find more people who are like us and who can go from being unemployed and unemployable to full-time, productive lifestyles. How has getting involved in PCORI-funded projects affected you? Sonya Ballentine: My life has changed in several profound ways. The instability I experienced because of poor mental health meant that I struggled with homelessness and couldn’t get a job. I am now a project manager at the Illinois Institute of Technology. I can now advocate for my mother and help her navigate the health system as she experiences health problems. And I have pulled together resources to help my community in the South Side of Chicago where there aren’t a lot of resources. PCORI’s funding of this project allowed myself and others a vehicle by which we can find more people who are like us and who can go from being unemployed and unemployable to full-time, productive lifestyles. Marilyn Perez-Aviles: I’m now in school and studying to become a substance use disorder counselor. I’m also working to become a peer navigator. I have always been a resilient person, and through this project I’ve found a purpose. I don’t see a lot of hope in the communities of Chicago, but in myself, I see a lot of hope because I’ve come a long way. I want to use my hope to help my community rise up and make progress in the area of mental health. The views expressed here are those of the author and not necessarily those of PCORI. Excellent. As my state of Georgia has been a national leader in the peer recovery movement, it is good to see research projects utilizing "peers" geared towards the health and wellness of mentally ill people who are also underrepresented. Hello. Thank you for your comment. We appreciate it. With such a high percentage of adults suffering from mental disorders, diagnosis and treatment should be taken much more seriously. I'm so glad to see that patients who have found treatment are now dedicating their time to helping others through PCORI-funded projects. More companies should look into starting business charities (https://businessfirstfamily.com/things-when-business-supports-charities/) for mental disorders, so they can dedicate funds and time to help with this epidemic as well. Through donating, big businesses could help people in serious need, while spreading the message about this issue. Hello. Thank you so much for your comment.